How to use these leaves... In Thai cooking 2/3 leaves are added whole to wet dishes like green or red curry and Tom Yum soup. When used whole the leaves are rarely eaten and are left in the broth. When chopped finely and added to dishes such as Thai Fish Cakes or Panaeng curry they are eaten and provide a delicious tangy flavour sensation. Add them straight to wet dishes, rehydrate them by steeping in warm water for a few minutes before chopping. What are Kaffir Lime Leaves ? The kaffir lime (citrus hystrix) is a small thorny bush that has both leaves and fruit that are used extensively in Thai cooking. The flavour of the leaf is unique, but is somewhat akin to lemon. The fruit is a wrinkled bumpy lime with a very strong zest. 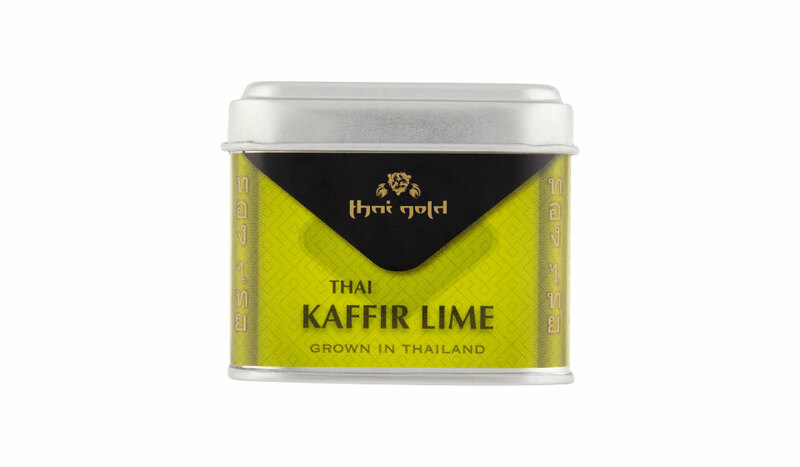 Kaffir lime leaves come from the Kaffir lime tree, a lime tree native to Indonesia. The leaves are highly aromatic and are widely used in Asian cuisines, especially Thai. They are easily recognisable by their emerald-green, double leaf lobes, which makes them appear as if two leaves are joined together.Kaffir lime leaves may be used fresh or dried, depending on the recipe or usage. The leaves should be used whole when simmering in soups and curries, and may be shredded for use in fish cakes or similar dishes. The leaf is rarely eaten; the one exception is when it is shredded extremely finely, such as for Tod Mun (fried fish cake). Fresh, tender young leaves are the preferred choice for salads; do not use dried kaffir leaves in salads. Kaffir lime leaves are perfect for adding flavour to any Asian dish. They are highly aromatic and add their own elegant flavour to stir-fry, curry, salad and fish cake dishes. Top Tip: Flavour rice - When cooking your rice, especially Jasmine rice, throw in a few leaves. The flavour will infuse throughout the rice. Dried Thai kaffir lime leaves 100%.